Buses are the main mode of public transport in Granada. The much delayed Granada Metro, an overground and underground transit system, is still under construction and not due for completion until 2014. Click on the red links to find information on buses routes serving the city and provincial destinations. Granada bus station La Estación de Autobuses is located 15 minutes by bus (3 and 33) or taxi north of the city centre on Carretera de Jaen (see map). Alsa covers the main routes within Granada province and Andalucía and also provides links from Granada to other cities such as Cordoba, A Coruña, Barcelona, Bilbao, Madrid, Malaga, Marbella, Seville and others. You can buy bus tickets directly at the bus station ticket office or easily operated vending machines, which is open 365 days of the year, online, at www.alsa.es. At the station you will also find tourist information, car rentals, lockers (not entirely secure according to some reports), restaurant and shop. If you are in a car arriving at the bus station you may encounter some ‘characters’ in the car park trying to ‘help’ you into your parking space. They are after money. Don’t be distracted by them and just say ¡No gracias! There is no direct service between Granada and Malaga Airport. Instead you take the intercity bus from Granada Bus Station to Malaga Bus Station from where you can catch bus 19 to the Airport. They run twice an hour between 06.40 and 23.40. This short hop takes around 40 minutes but quicker way to transfer to the airport may be to take the local train. Autocares Gonzales runs a direct bus service between Granada City Centre and Granada Airport. 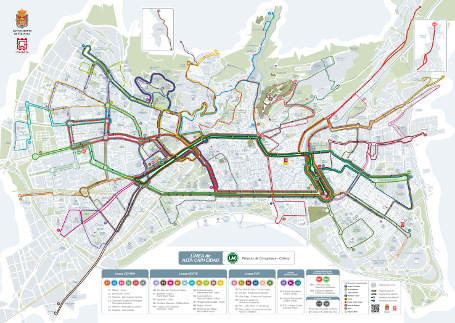 The route, which takes approximately 40 minutes runs from Paseo de Violón (Palacio de Congresos) via stops on Acera del Darro, Gran Via de Colon, Triunfo, La Caleta, Granada Bus Station and Avenida Andalucía. The fare is €3 which is paid on the bus. The service from the airport into the city synchronises with flight arrivals. City services run between 06.00 and midnight and a standard ticket costs €1.20 but if you buy a travel card the bus trip would cost you €0.79. The minimum recharge value of a travel card is €5. There are two circular night buses lineas búho 111 and 121. They run between midnight and 06.00 and the fare is €1.30. Click on the map to view the map and route details on the Granada Transport site. Alhambra Buses provide minibus services linking the city with the places that the regular urban buses cannot reach: Alhambra, Sacremonte and Albayzín. They run every 7-10 minutes, 365 days of the year. The Alhambra buses routes 31 and 35 depart from Plaza Nueva, and routes 30 and 34 from Gran Via 1. The fare is €1.20 per ride and you can also use a travel card. The bono is a travel card allowing multiple journeys on all city routes including Alhambra Buses. You buy the card on board and it brings the cost of a single fare down from €1.20 to €0.79. It costs €2 (€5 is the minimum when you top up) and several people can travel on one card. This is great value and really useful if you are in a group or you know that you are going to be hopping on and off buses. A bus service runs between Granada Bus station and Pradollano Parking up at the ski station. The journey time is approximately one hour and costs €5 (€9 return). Tickets can be purchased up to 2 days in advance of travel but are only available from the ticket office at Granada Bus station. If you want to buy tickets on the same day arrive early. Outside the season the bus leaves Granada at 09.00 and returns at 17.00 from Pradollano. 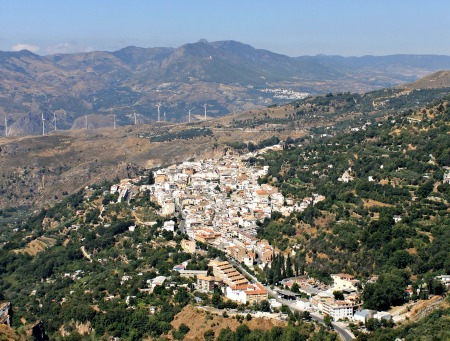 Alsa operates buses between Granada and La Alpujarra. The Granada-Lanjaron-Orgiva buses, some of which stop in Lecrín, run several times a day but links to other villages in the area are less frequent. For more information on timetables and prices visit the Alsa website.